I probably shouldn’t remember this part of the evening, but on my boyfriend and I’s first date ever, we went to a vegan restaurant where I ordered a portobello mushroom steak. Considering how much I wouldn’t shut up about how amazing it was, I am truly very very very lucky that he’s stuck around this long. But I recently went back to that restaurant, ordered the same dish, and they brought me a cauliflower steak instead. What?! It still tasted great, but I must admit I was pretty disappointed. So I set off to make a version at home instead, because I make my own dreams come true. I made this for Christmas dinner and it ended up tasting exactly like I hoped it would. 1. Heat vegan butter in a large pan on medium until it begins melting. 2. Add garlic and onion. Pour half the broth, half the soy sauce and red wine into pan, mixing together. 3. Add mushroom caps to pan. Pour remaining broth and soy sauce directly on top of mushroom caps. Add the basil, thyme, salt and pepper at this point as well. 4. Let cook for 2 minutes, then flip. Continue to do this until both sides have browned, mushrooms are completely coated and there’s no more sauce in the pan. If the sauce evaporates before the mushrooms are fully browned, add a bit more broth and garlic, then keep cooking. 5. Remove from heat. Serve immediately with side dishes — I opted for shepherd’s pie with gravy and Hilary’s gluten-free holiday stuffing. Serve hot. Makes 2 servings. 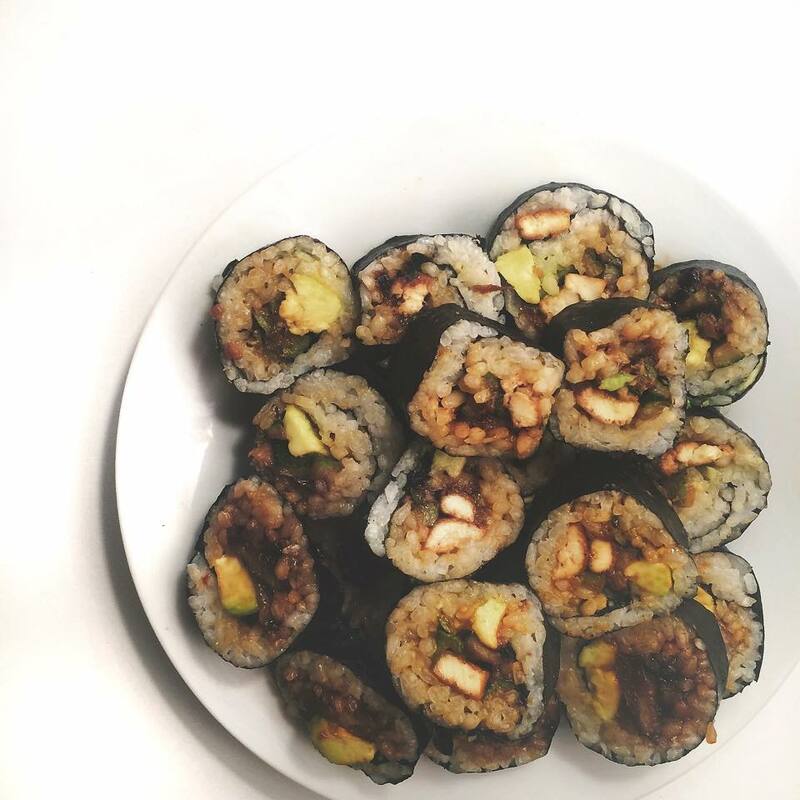 Two of my favourite things are vegetables and rice, so naturally I love sushi. There are only so many gluten-free/vegan take-out options though (I’m getting sick of cucumber rolls), so I decided to make something more interesting instead. Other supplies you’ll need: One standard bamboo rolling mat + chopsticks. Wash rice in cold water thoroughly. Bring hot water to a boil with the rice already in the pot. Cook covered for 20 minutes until water has been entirely absorbed and rice is sticky in consistency. If the rice is too hard, add water by the teaspoon and continue cooking. Be careful not to add too much water! I did the first time and it got so mushy that I had to start over. Fluff cooked rice with fork and set aside. Slice tofu into thin strips. Marinate in soy sauce and nutritional yeast for 10 minutes. In medium saucepan, heat a dash of EVOO until it sizzles. Sprinkle tofu with garlic and onion while cooking, and fry tofu until texture is very firm. Set aside. Cut zucchini and eggplant vertically into very thin, long strips. Pan-fry on medium heat in EVOO and add red pepper flakes, lime juice, salt and pepper. Cook until vegetables have browned, then set aside. Line your bamboo rolling mat with plastic wrap to avoid making a big mess and place a glass of water next to your work station. Important: Wait for your vegetables and rice to cool, otherwise the rest of this process will be harder than it needs to be! Lay the rolling mat flat and place a couple spoonfuls of rice onto the middle of the sheet. Wet fingers and pat rice lightly down into a thin even layer. The rice doesn’t have to go right to the edges — basically, try to create a rectangular section of rice within the rectangular piece of seaweed 1/4 inch from the edge. Align the tofu strips, eggplant, zucchini and avocado into a very thin horizontal line at the bottom of the rice. Be careful not to overfill. 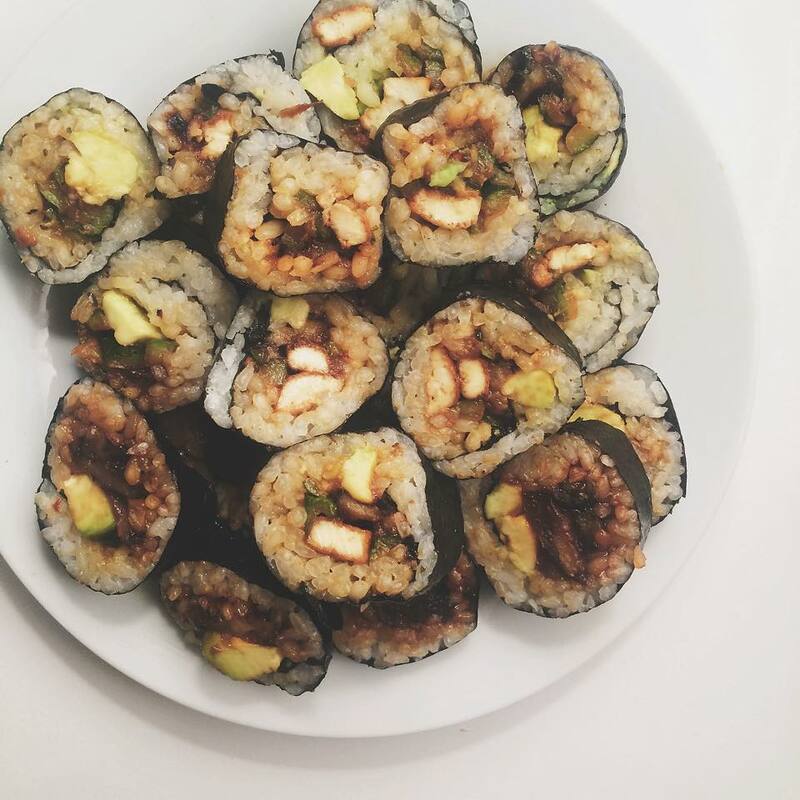 I combined all of my ingredients at once but you can do designated avocado rolls, eggplant rolls, and so on if you’d prefer. Tightly roll the seaweed sheet from the bottom, using the mat to press it together. Keep going, squeezing the roll to prevent it from falling apart. Dab a bit of water on the edge of the seaweed to seal it. Use a sharp knife to slice the roll into bite-size pieces. Wet the knife between cuts to keep it clean. Important: Having trouble doing this right? Use this easy guide here to help. Keep rolling! Make as much as you’d like and get creative with your fillings. Serve with gluten-free soy sauce and eat with chopsticks. Makes approximately 4 rolls (2 servings). Earlier this month Alex, Aine and myself participated in a 3 day juice cleanse. That’s right! No food, no coffee, nothing but juice. 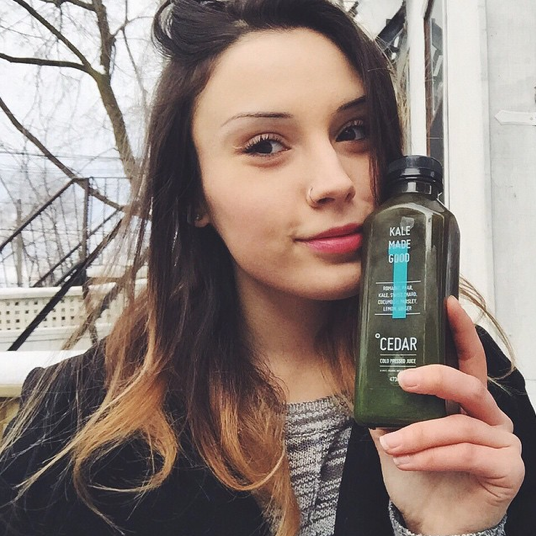 We chose Cedar Juice, a company making cold-pressed juice that is never pasteurized and uses only organic produce and superfoods. They ship across Canada and the juices will arrive at your doorstep 48 hours after placing your order, free of charge! We’d all been mulling over the idea individually for a while but were a little nervous, so having each other for moral support definitely helped. To prepare the night beforehand we did a major fridge clean-out to prevent any temptation to cheat — but more importantly, to make room for 54 bottles of juice. Fifty four! Holy heck! That’s six bottles a day each for three days. 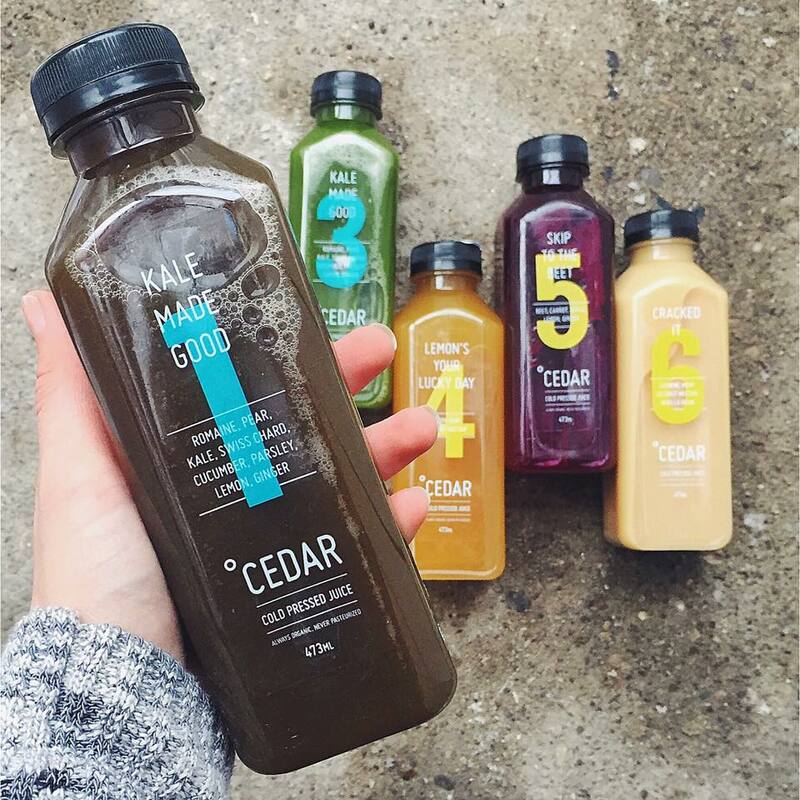 If you’d like to try a 3 or 5 day cleanse, use our promo-code “BG-vegangirlfriend” while ordering Cedar Juice online and receive 10% off! Offer is good until the end of February. How I prepared for the cleanse: I’m a full-time university student so I went through my daytime planner and found a break between midterms where I’d be able to sleep properly and avoid overexerting myself. 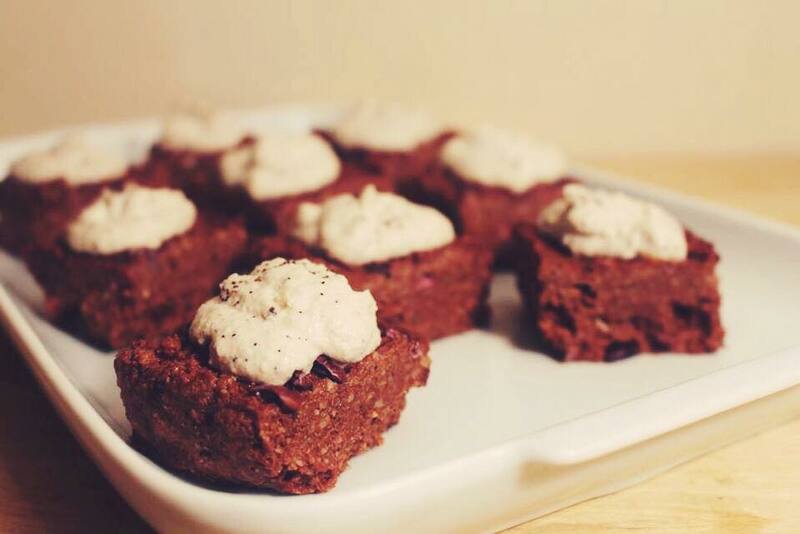 Past cleanse experience: I’ve done week-long raw food cleanses every few months for the past two years to aid with digestion and generally look after my body. Because of this and my 100% gluten-free vegan diet, I likely experienced less severe detox symptoms than most would. Day One Summary: I had been out drinking the night before, which was an awful idea because it resulted in detox symptoms hitting me very quickly. I felt light-headed and the extreme cold weather just made that worse. I spent most of the morning worrying that I made a huge mistake spending money on a cleanse that I wouldn’t be able to stick to. As I pushed through juice after juice throughout the day, my body adjusted and I felt a lot better. I was surprised by how good the juices actually tasted. 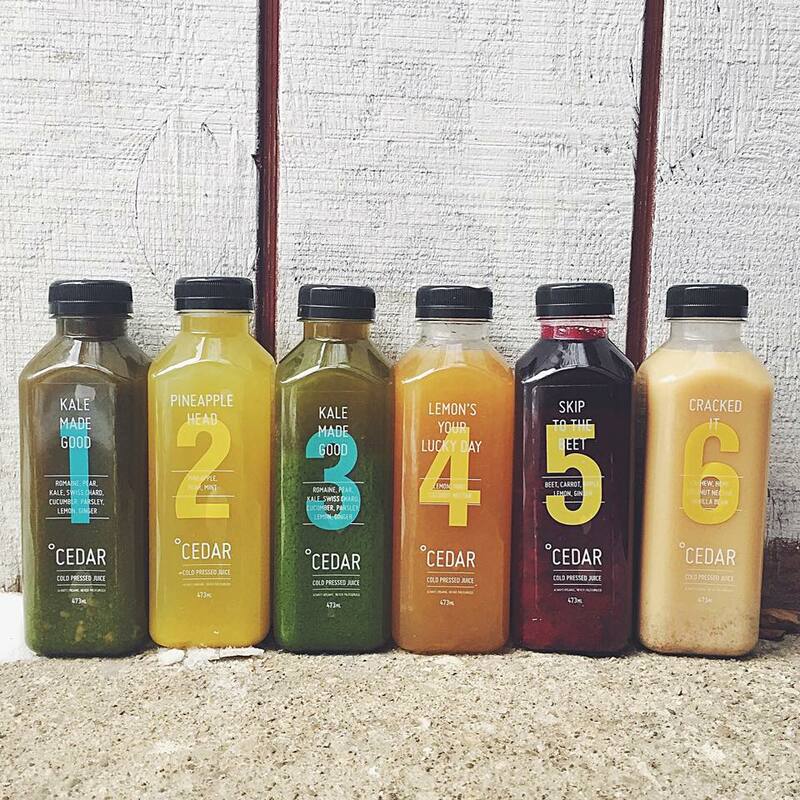 I immediately appreciate how Cedar Juice set up the drinks to be consumed in a specific order so that a sweet taste followed a vegetable-based one. Day Two Summary: No more detox symptoms! I felt a bit nauseous first thing in the morning, but I’m assuming that was from hunger as it stopped immediately after my first juice. I had made sure to sleep a lot the night before, which helped with my caffeine withdrawal the following morning. My stomach stopped growling by midday and I started thinking about food less. I was sitting on the train that evening and a small child gasped and pointed at my bottle of beet juice. He turned to his mother and said, “I didn’t know vampires drank blood with straws!”. I looked pretty tired and my teeth were stained red, so I’m sure I gave that kid quite a scare. Day Three Summary: By the third day I felt very confident that I wasn’t going to give into any cravings. I had fallen into the routine of a liquid diet very quickly to the point where I felt comfortable with it. I switched up the suggested order a bit to avoid drinking beet juice in public like I had the previous day. Additionally, I made plans to go for brunch the following day with a friend to have something to look forward to. Main Symptoms: Bloating, headaches, cravings. Best part: My head felt SO clear by the second day, and has ever since! I have a history with anxiety and related mental health issues, so I was pleasantly surprised that this helped my mindset. Worst part: I experienced beeturia (an actual thing!) which is when beetroot passes through your system and alters the colour of your urine. It looked like I dumped the entire bottle of beet juice directly into the toilet, which is probably what most teenage boys think an ordinary period looks like. It didn’t cause any physical pain, but definitely caught me off guard. Favourite flavour: #6 “Cracked it” by far was my favourite! It felt like I was rewarding myself with dessert after a hard day’s work (of not eating) and I’m a sucker for vanilla bean. Did I cheat? Nope! Not even a little. Again? I would definitely do this cleanse again! I found myself wishing I was still on the cleanse a few days later, after something I ate had given me a stomachache. Additional notes: It’s hard balancing school and work, but I wish I’d done this cleanse when I could have been on a break from both! I have a labour-intensive job and worked all three days. It was tough, but manageable. If you have a busy schedule like I do, carry your juices in a backpack and keep them refrigerated throughout the day if possible. How I prepared for the cleanse: Three days before the cleanse began, I consumed mostly raw food. I took hot baths to aid in relaxing my body as much as possible. I ate an entire bag of tortilla chips the night before to prevent myself from giving in and eating them during the cleanse. Past cleanse experience: None! I tried to do a week long raw cleanse while Meg was doing one last year, but at the time I was having issues with blood sugar so I only lasted a day. Day One Summary: Oh boy. It was rough. I couldn’t sleep well the night before and had a 10 hour school day ahead of me. I go to school for comedy performance, so my days are physically exhausting with rehearsals. I could barely think straight during a midday meeting with a professor! By the time I got home, I was feeling pretty light headed so I went to bed as soon as I could. Day Two Summary: I started the second day fighting awful cravings to stress eat, but I knew that I would feel less stressed after eliminating toxins from my body. Although I was a bit sluggish physically, I was extremely mentally alert. I did a 6 hour rehearsal and focused the entire time. It felt great! That night I was so tuckered out from all the hard work I went to bed as soon as I got home. Day Three Summary: The final day was a breeze. I worked a 9 hour shift and was initially worried that being surrounded by food all day I’d go crazy, but I didn’t find myself craving anything but the juice, which I sipped happily throughout the day. The day went by quickly and I felt fine. 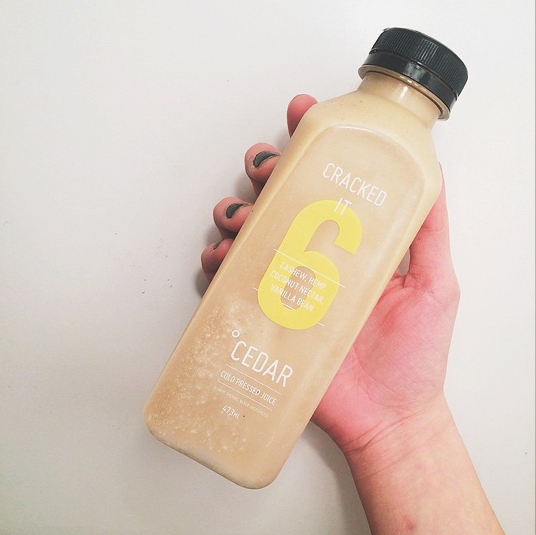 I actually bought a few bottles of Cedar juice from Bolt Fresh Bar on my way home! Symptoms: Upset stomach and a bit of dizziness, but nothing horrible. Best part: Catching up on my sleep was wonderful! My dreams were insanely vivid and fun, and I woke up both mornings with ideas for new sketches. 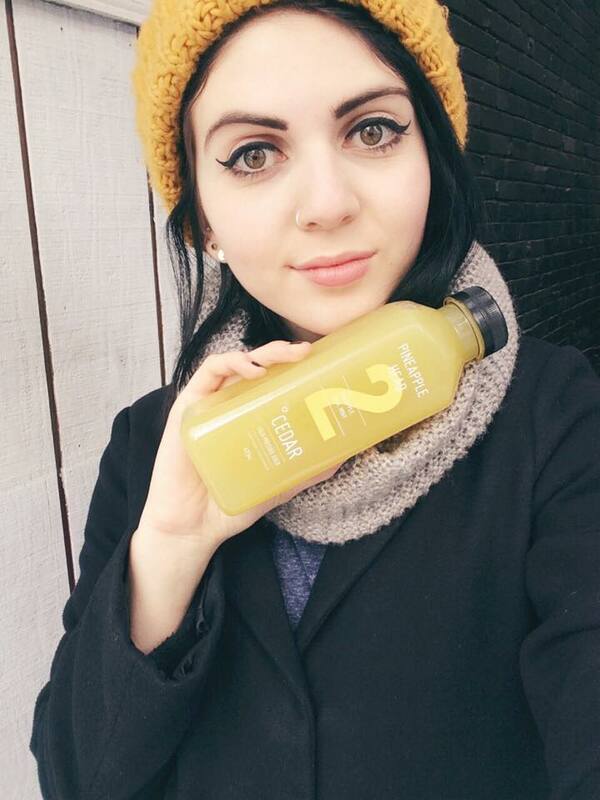 Favourite flavour: My favourite juice was #4: Lemon’s Your Lucky Day. It tasted great and provided the perfect midday energy boost. Did I cheat? I ate an avocado on the second day before bed, and washed it down with some organic lemon juice. I also ate some plain quinoa on the final night. I was overworked and scared I was going to faint. Again? I’d do it right now if I could. Additional notes: Stay hydrated! Anytime I felt hungry and it wasn’t time for another juice, all I had to do was drink water and I would feel fine. Plan ahead! Learn from my mistake! I would have enjoyed the cleanse more than I did if I wasn’t so busy. Ease out! The first day off the cleanse I ate nothing but raw foods and juices. Even two weeks later, I still find myself choosing smoothies over solid foods. How I prepared for the cleanse: The day before the juice cleanse I wanted to help my body deal with the transition from solid food to juices, so I made sure to drink plenty of nutrient-rich smoothies. I knew that the first day of the juice cleanse would be slightly exhausting with work/school, so I made sure to get enough sleep so that I was fully rested. Past cleanse experience: None! As a gluten-free vegan I already have a daily clean/wholesome diet that incorporates whole foods regularly. Day One Summary: I started the cleanse with a positive mindset. By midday I was feeling a little tired and hungry, but then I remembered how important it is to keep hydrated between juices. After drinking some water I started to regain my energy and the hunger subsided until it was time for my next juice. It wasn’t until about 8pm where I felt like I was starting to experience detox symptoms such as nausea and weakness. I started to miss the motions of eating. I wanted so desperately to crunch down on some almonds. After finishing all the juice, I drank some water and went to sleep early. Day Two Summary: After my first juice of the day, my body felt a little stronger and I had enough energy to get me through the day. I studied in a coffee shop for a while and was seriously distracted by everyone around me sipping on lattes and munching cookies. At this point I knew I was so close to finishing the cleanse and was so happy and motivated to keep strong until the end, but I was longing for a big bowl of hot hot soup. Day Three Summary: On the third day I was looking forward to each one of my juices. 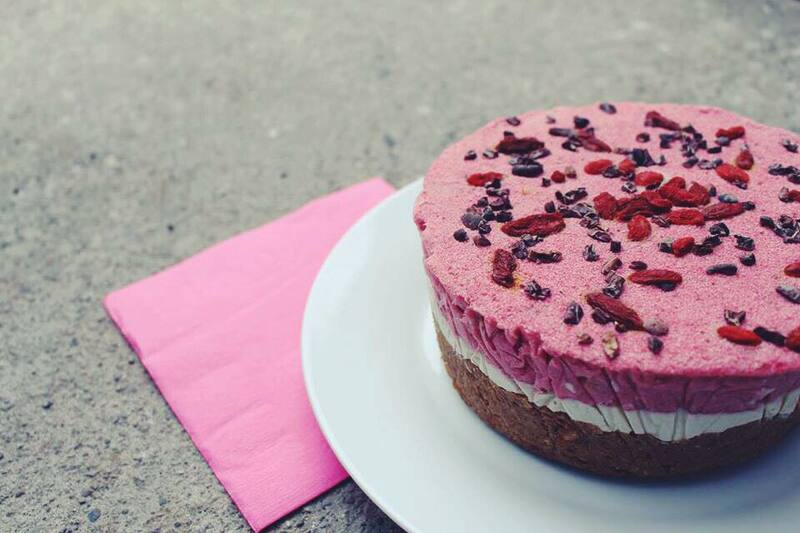 They kept me satiated and energized as I went through my busy day and I successfully avoided taste-testing the vegan cheesecake I made for Valentine’s Day. I was feeling more and more full with each juice consumed. 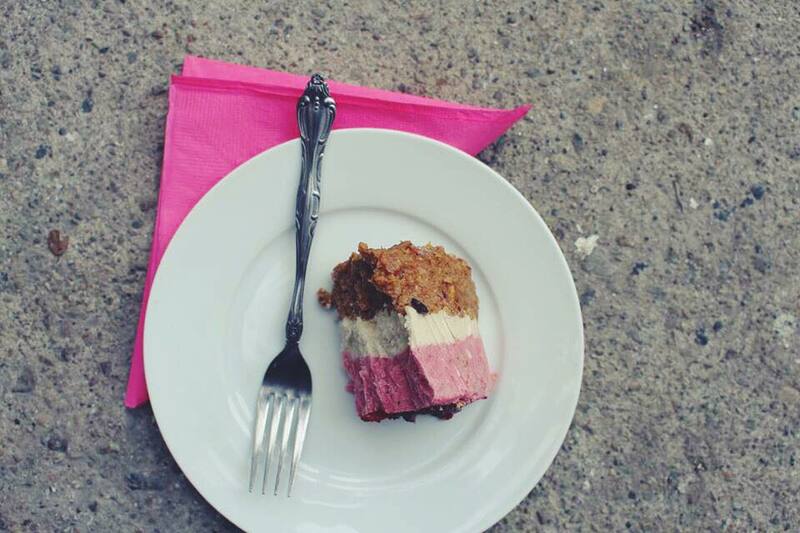 At midnight I broke the fast and treated myself to a vegan/gluten-free treat from Bunner’s Bake Shop. Best part: My body felt refreshed and energized! Worst part: The initial feeling of nausea on the first day of the cleanse. I thought I would feel sick throughout the entire thing, but it subsided by the next day. Favourite flavour: “Pineapple Head”. It tasted like a piña colada! Again? Absolutely! I feel like maybe next time I’d like to push myself and try the 5 or 7 day cleanse instead. Additional notes: I would like to possibly eat raw the day after the juice cleanse finishes to help my body have an easier transition into solid foods again. I jumped straight into food post-cleanse and am curious as to how my body would benefit from going with this approach. Next time around for sure! 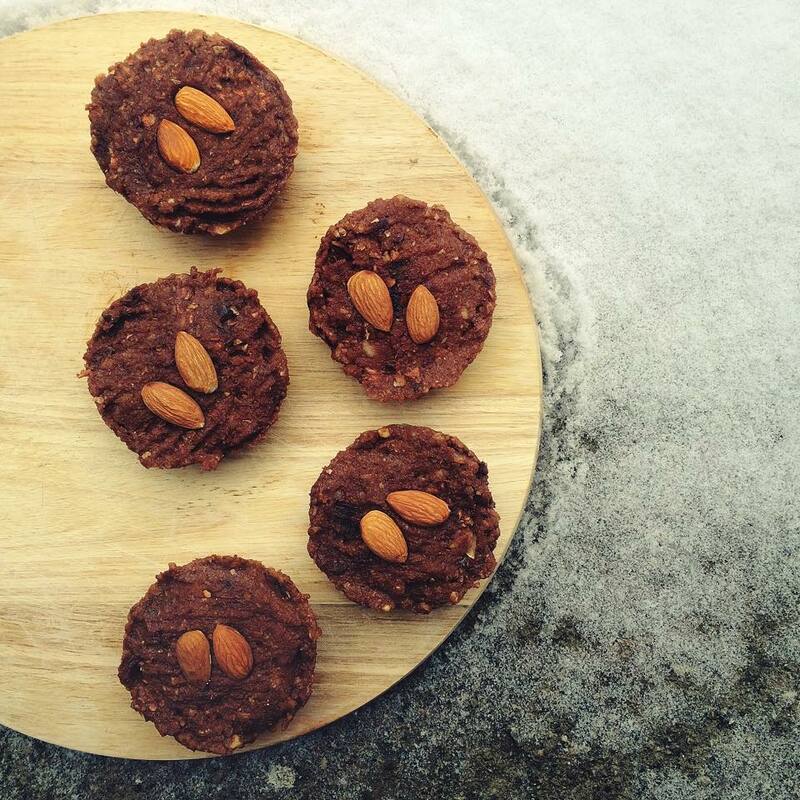 I picked up a tub of dates and a bag of almonds from the grocery store on my way home last night, then improvised the rest with whatever I could find in my kitchen! 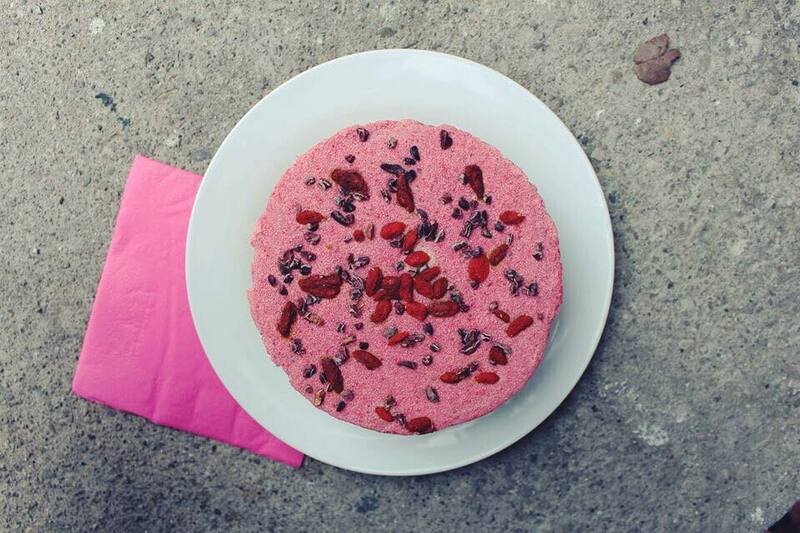 This dessert is raw, gluten-free, vegan, refined sugar-free, no bake, and extremely easy to make. After soaking, drain dates and almonds. In a high-speed blender or food processor, combine dates and almonds until thoroughly incorporated. Add cacao powder, nibs, coconut oil and agave nectar. Continue blending. Line standard cupcake tray with plastic wrap. Scoop batter into cups and compact each by pressing down with a fork. 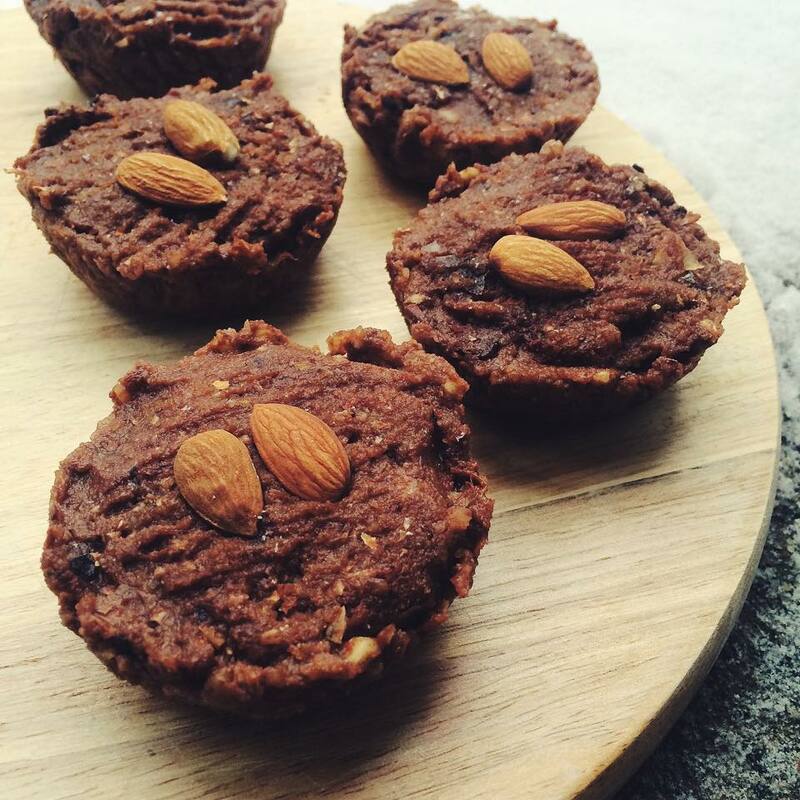 Top each tart with two raw almonds as garnish. Leave in freezer for 12 hours to set. Carefully remove tarts from tray. Let thaw in fridge for at least 2 hours before serving (leftovers can be kept frozen). Serve cold. Makes 6 tarts — 5 are pictured, but that’s because I ate roughly one sixth of the batter. Oops! I used to hate mocha anything as a kid. How foolish of me! 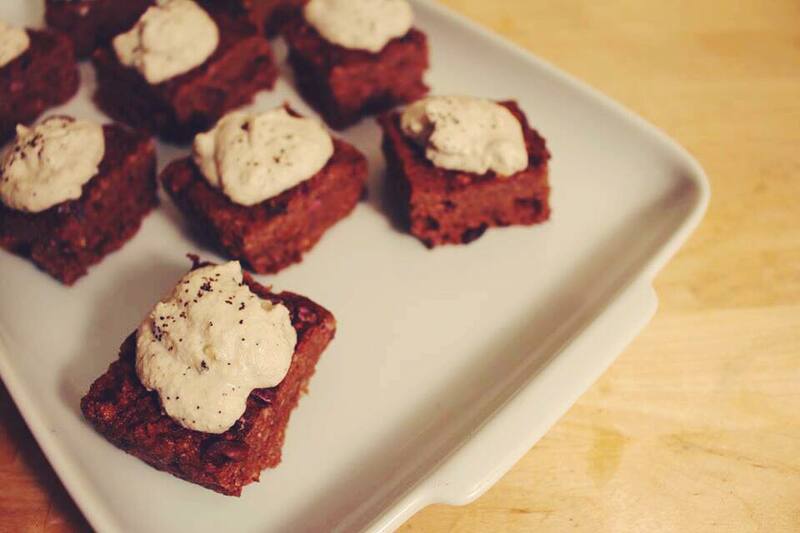 Thankfully my tastebuds matured eventually and now I incorporate the flavour as often as possible, like I did with these perfect little desserts pictured below. 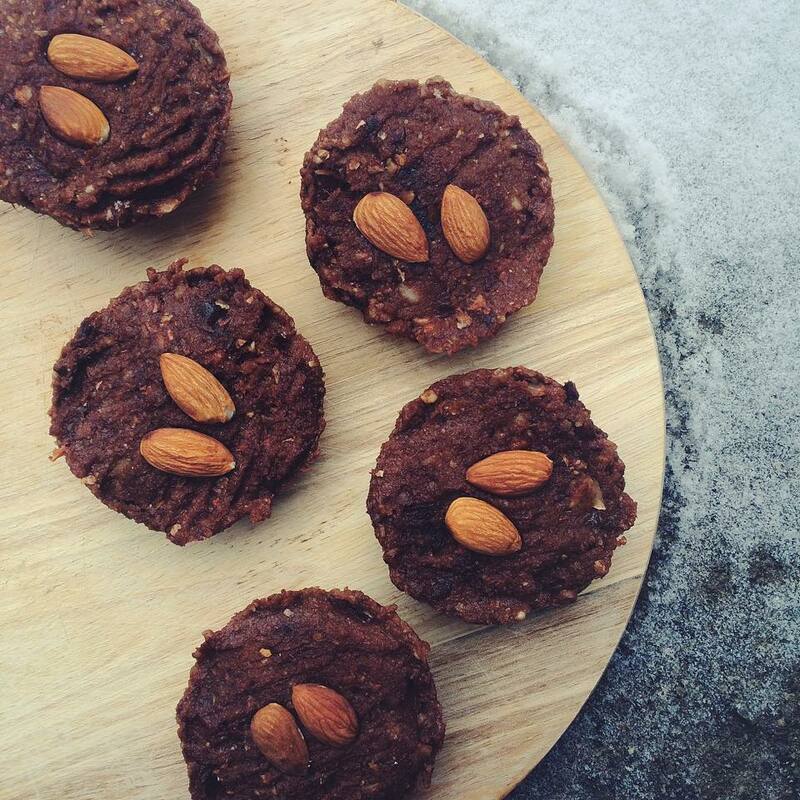 This recipe is gluten-free, vegan, no-bake, refined sugar-free, and 95% raw. 1) Combine dates and almonds in a high-speed blender or food processor until finely chopped. Add cacao powder, cacao nibs, coconut oil, syrup, espresso and salt. Continue blending until thoroughly combined. 2) Line a square baking tray (I actually used a tupperware container) with plastic wrap. Pour the “batter” in and use a fork to press it down firmly and evenly. Top with additional cacao nibs if desired. Place in freezer for 1 hour. 3) Blend cashews, lemon juice, water, coconut oil, syrup and espresso together. Combine until no cashew chunks are visible and the texture is smooth. 4) Grab edges of plastic wrap tightly and pull upwards to remove brownie base from tray. Use a large cutting knife and separate the base into squares. 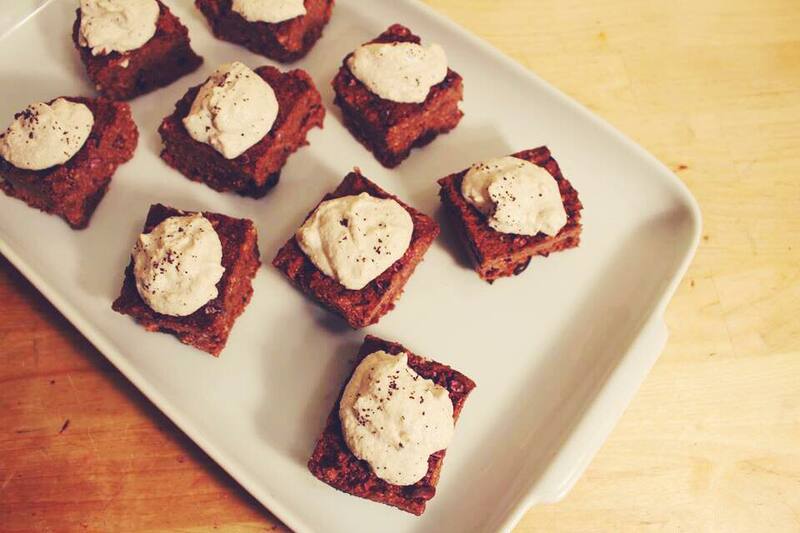 5) With a spoon, top each brownie with a dollop of cashew cream. Add a sprinkle of espresso to each as garnish. Serve chilled. Makes approximately 9 brownie bites. To store: Keep in freezer. Thaw in fridge for 2 hours as desired. I feel better both physically and mentally when I avoid processed food. With the exception of black coffee, tofu and a few other treats here and there, I try to eat raw whenever possible. 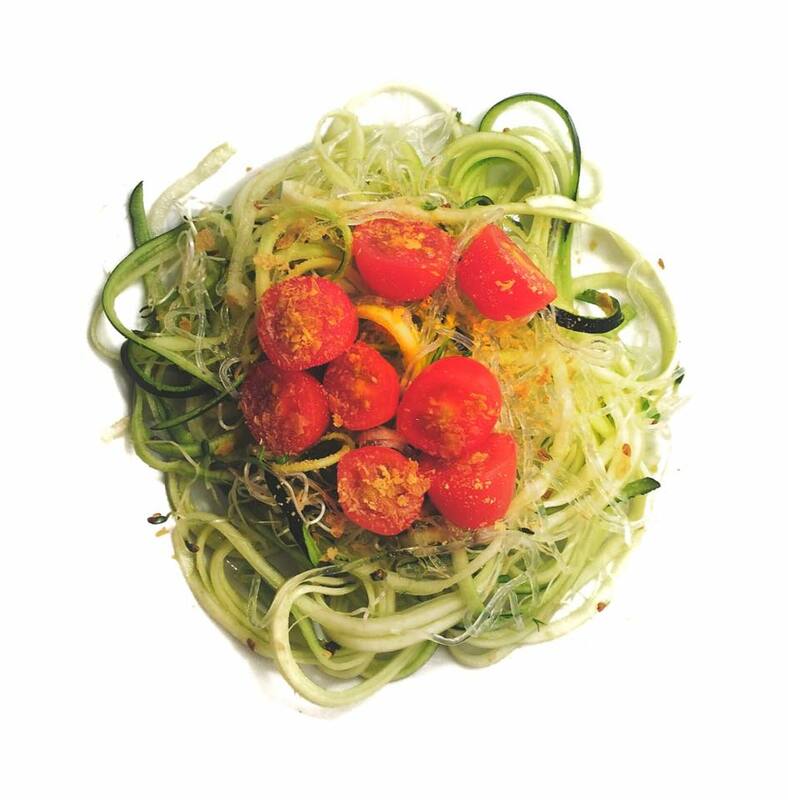 The health benefits of a raw food diet are unreal and you should totally read up about it here. Using a high-speed blender or food processor, combine dates and almonds. Add a splash of water if you’re impatient like I am, and continue blending until finely incorporated. Line a cake pan or tin with plastic wrap. Pour mixture into pan and use fork to press the mixture down into an even crust. Place in fridge. Blend cashews, lemon juice, coconut oil, liquid sweetener and water together until thick and very smooth. Pour majority of “batter” on top of crust evenly, but set some aside for next step. Place pan back in fridge. Blend remaining cake “batter” with frozen strawberries until a similar consistency has been reached. Pour on top of second layer. Add your garnish. 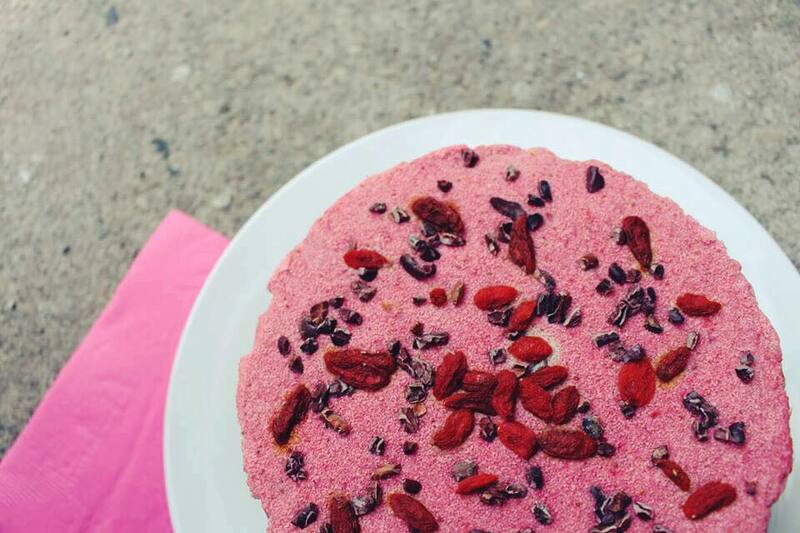 I topped mine with goji berries and raw cacao nibs, but fresh fruit or coconut whipped cream would be delicious as well! Leave cake in freezer overnight to set. Move to fridge to thaw for two hours before serving. Serve chilled.